Description: 3D Live Pool simulates pool on your computer with full 3-D environment and perfect 3d sound. It features easy and addictive game play, supports 3-Ball, 8-Ball, 9-Ball, 15-Ball, Straight, Rotation, BlackJack and Bonus games.3D Live Pool has single and multi-player modes both, you can play with computer, friends or even remote players. It's also a perfect simulator to improve your pool gaming skills effectively by learning game physics on a PC. Description: 8 ball secrets Discover the foundation you should have learned when you first started-the eye-opening information found in the first chapter sets the tone for the book and instantly gets you excited about learning all those things you missed. Learn how to tell what strategy your opponent is using against you-once you know what the opposition is thinking (and why), you gain an immediate, decisive, and unbeatable edge over them. Description: Survey of the sport and fighting style of MMA. From the early days to nowadays, learn every aspect of this rising fighting sport. Description: American Gladiators is a video game made in 1991 by for the Amiga, Sega Mega Drive/Genesis, Super NES and Nintendo Entertainment System. It is based on the popular TV game show, American Gladiators. The NES version varied greatly from the others as well as the game show itself in that the events were morphed into side-scrolling and overhead mini-levels that only partially resembled the real-life events. Description: Men like to do silly things. This has to be one of the silliest ones. You are standing on your arms on top of the beer barrel. There are your friends cheering you up to do as many push-ups as you can. Well the first one shouldnt be to hard to master. But with every next push-up you make, your arms get weaker and your will become troubles keeping your balance. Description: Enjoy pool night at home! 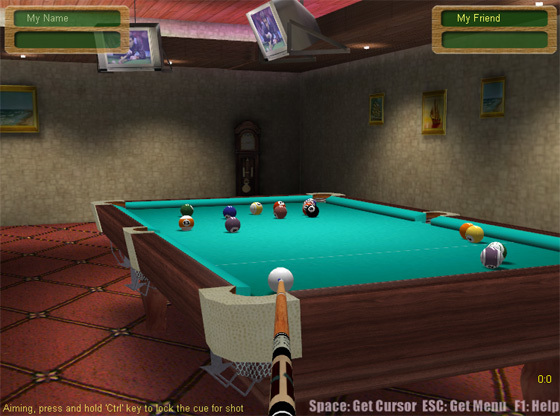 This 3D billiard game is going to be your favorite! Feel the pressure of playing a great pool game in the comfort of your own home. Don't wait, grab a stick, and avoid the eight ball!